After the most sensational of World Cup stories, the most dramatic of World Cup games, and a stunning Cristiano Ronaldo hat-trick it feels like Russia 2018 is up and running. Even that barely begins to tell the story of a match rich in the highest quality and most enthralling of sub-plots - and replete with one of the great performances from one of the greatest ever players. Spain displayed supreme resilience to overcome the turbulence of the last week, and went on to put on a real display of quality only for Ronaldo to still find a way to overshadow all of that. The Portuguese star overcame his own pre-match problems after the verdict of his Spanish tax case was announced - he has accepted an €18.8m fine and a two-year suspended jail sentence - with that uncharacteristically the only reason he was mentioned in the build-up due to the jaw-dropping sacking of Julen Lopetegui. By the end, though, you couldn't but talk about him. 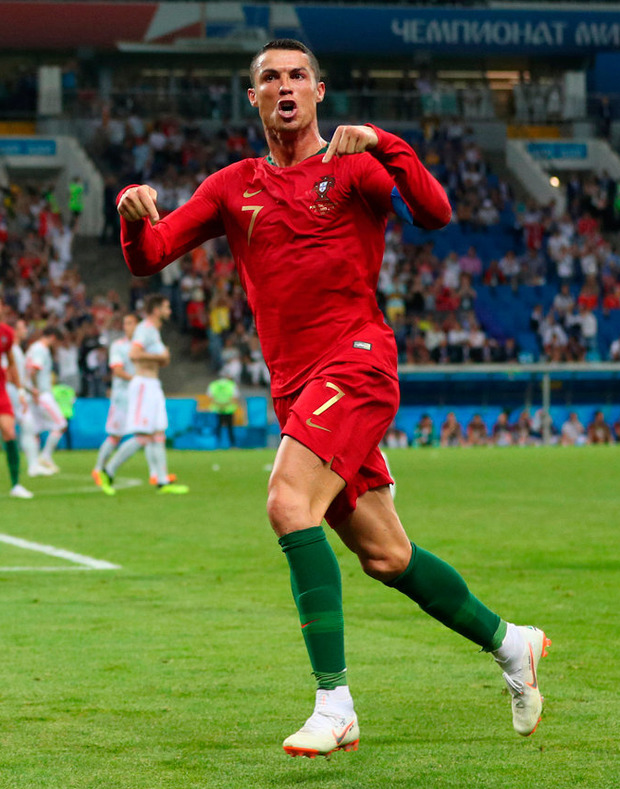 You couldn't but marvel at him, as he put in probably his greatest tournament performance, having just become the first player to score in eight of them in a row. He crowned that with an 85th-minute and rare curling free-kick to secure a point. It was probably a fair result, and yet that still doesn't feel like it does either team justice. It doesn't do the game justice, either, one that twisted and turned as much as Diego Costa for his initial equaliser. There was also Real Madrid's further role in Spanish frustration, for one. With Spain's most successful club having already taken their manager, their biggest star then took those two points off them with those three goals, one of them from the penalty sport after a foul from club team-mate Nacho. The full-back redeemed himself in spectacular fashion with what was maybe the game's best goal in terms of pure quality, but there was also the positive charge of Costa and the scarcely believable error from David De Gea. That Spain had overcome that alone said a lot them, but Portugal also look like they could again go far, even if both sides similarly displayed flaws that may eventually cost them. 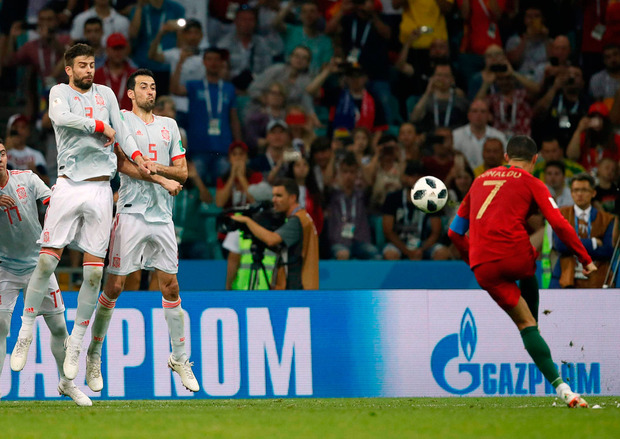 Even if Spain eventually - and creditably - overcame it, they did start the match suggesting the disruption of the last week had got to them, such was the disarray of their defence. Fernando Hierro's side looked extremely susceptible to every Portuguese surge, and especially those of Ronaldo. After just two and a half minutes, he twice stepped over the ball in a blur of movement, enticing his Real team-mate Nacho to commit himself and commit a foul. It was a justified penalty, even if Ronaldo won it in every sense. The Portuguese was already looking to the referee as he went down. De Gea could only look on as Ronaldo of course scored. It was just his fourth World Cup goal at that point, but did mean he had also become the fourth player to score in four consecutive World Cups - after Pele, Uwe Seeler and Miroslav Klose - to go with his tournament record. The most remarkable figure was really 33, though, because for Ronaldo to be this fast at that age is astonishing. He has recovered his rampaging running style outside the box, something we really haven't seen from him at a tournament since 2010 due to fitness issues. Spain by contrast looked remarkably leaden at this point. 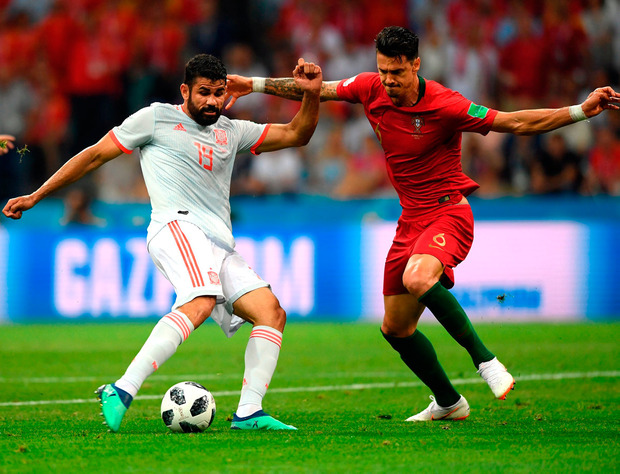 That did change with the electrical charge of Diego Costa, who showed he will never change, as he scored the most quintessentially Diego Costa goal. It was borne of pure resilience and tenacity … and maybe a foul. The striker initially won the ball with a collision that ironically saw the usually aggressive Pepe feel the brunt of his arm - if not his forearm. Costa had no support, and a lot of defenders around him, but it didn't matter. All that mattered was his resolve. He turned three times, buying himself the space, before firing the ball past Rui Patricio. Spain suddenly looked like Spain again, and were beginning to pull Portugal all over the place with their passing, before Isco nearly put them ahead with a powerful shot off the underside of the bar. If they'd intensely raised their level, though, De Gea had inexplicably dropped his. The goalkeeper had actually made an error in the warm-up match with Switzerland and hasn't really looked at his best over the past few weeks. He then made one of the worst mistakes of his career, as he allowed a low and hard Ronaldo shot through his fingers just before half-time. Then again, it couldn't escape notice that the Portuguese defence weren't looking as durable as they usually do… but that was likely down to a much more prosaic reason: age. Pepe and Jose Fonte were beginning to look every bit their collective 69 years. After Andres Iniesta had won a free-kick with yet another wondrous piece of movement, David Silva lofted it up, Sergio Busquets headed it down, and Costa, again having that bit too much space around him despite being so close to the goal, prodded it in. Spain had shown creditable resilience, and now began to properly show their resplendent creativity. Iniesta, Silva, Isco were lusciously linking up with exponential effect, as Portugal increasingly began to tire against such movement, and in such heat. Spain's peak, and maybe the most sensational display of pure technique in the match, was however something much less intricate. It was instead explosive, as Nacho exquisitely fired a low volley in off the post. It was not the game's peak, though.